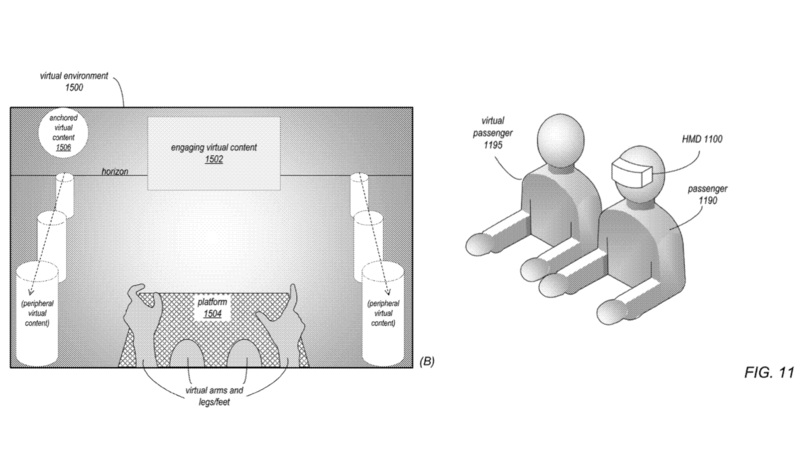 The US Patent and Trademark Office has published an Apple patent application that details a pretty neat VR system. Spotted by Patently Apple, it’s meant to be used in vehicles — including self-driving vehicles — and Apple pitches it as a way to mitigate motion sickness. But the company also describes a lot of other interesting applications, many of which could be used to turn a standard ride in an autonomous car into a business meeting, a concert or an exciting, zombie-filled adventure. The application says that the system could include a VR headset or a projector that would display the images on interior walls of the vehicle. In regards to motion sickness, the system could include a variety of sensors that could monitor the passenger and determine when they might start feeling ill. Sensors that can detect sweating, pulse rate, fidgeting and swallowing, for example, could be used to pick up when the passenger is beginning to show signs of motion sickness and the VR experience could be adjusted to mitigate that response. The system could adjust to make sure all real-life movement and acceleration experienced by the rider matches up with what’s being displayed to them in VR. Visual anchors, displaying a virtual platform below the user or providing visual cues ahead of turns and stops, could all be used to ease a rider’s discomfort. But beyond motion sickness prevention, the VR system could also be used to entertain the rider. Apple describes introducing virtual riders into the car, like authors who can read their book to the passenger, as well as coworkers who can all virtually meet for a conference in any number of virtual environments. Riders could also choose to experience fun activities, such as floating down a river, hang gliding or chasing down zombies. Vehicle features like the heating and air system as well as the audio setup could be used to enhance the experience. And car motion could be incorporated into the virtual environment. For example, stopping at a light could trigger your virtual car to stall as zombies approach you and going over a speedbump could be translated into running over one of the zombies in VR. Keep in mind, this is only a patent and it doesn’t mean these concepts will ever come to fruition. But it’s certainly a cool idea. And this isn’t the only VR-focused patent from Apple — which also recently bought an AR/VR-focused startup — to surface recently, so it seems as though the company has its eye on this sort of technology.